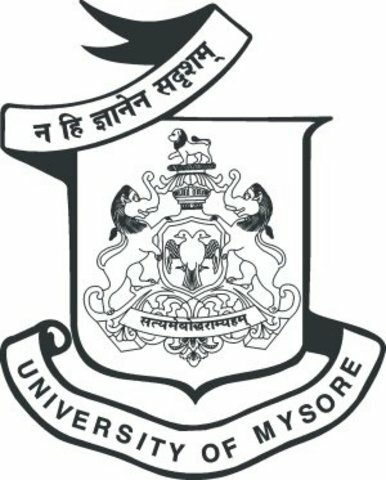 The University of Mysore is the 6th oldest university in India and the oldest in the state of Karnataka. It was established in 1916 by then Maharaja of Mysore,Krishnaraja Wodeyar IV, after two of his educational experts (C. R. Reddy and Thomas Denham) undertook a five-year study of higher education around the world. The University of Mysore is a public state autonomous university in Mysore recognition from the University Grants Commission.,(UGC), India. The university was founded during the reign of Krishnaraja Wodeyar IV, the Maharaja of Mysore. It opened on July 27, 1916. Its first chancellor was the Maharaja of Mysore; the first Vice Chancellor was H. V. Nanjundaiah. The university became the first outside of the Britain administration in India, the sixth in India as a whole, and the first in Karnataka, when it gained recognition from the University Grants Commission.It is being Accredited as A+ Grade University By NAAC.